Interessante supplemento alla rivista Visaya, fondata da Guido T. Poppe. Il lavoro è dedicato alle terebre di Vanuatu e propone la revisione del Genere Granuliterebra Oyama, 1961.
text-figures, 242 maps, 143 b/w text-plates with 1354 photos and 320 colour plates with 2015 photos, 26 of those showing living animals and 268 in the determination tool. There are two standard binders necessary to fit the volume that will have a weight of approx. 6 kgs. 2+65 S., 81 Fig., 40 Ktn., 44 col. Taf. This first part of the Iconography series on land snails illustrates on 44 full colour plates 54 species, subspecies and forms of the gigantic snails of the former ³Lemurian continent², belonging to the genera Acavus and Oligospira from Sri Lanka, Stylodonta from the Seychelles and Clavator, Paraclavator n. gen., Embetoniphanta n. gen., Helicophanta and Eurystyla from Madagascar. Besides the two new genera, three subgenera are described new to science. Full synonymy, data on type-material, geographical range (with 40 individual maps) and size are given for each taxon, as well as a full description of each shell, including remarks on habitat and biology. Currently in preparation: The Family Acavidae - Genus Ampelita s. lat., also by Groh & Poppe, dealing with over 100 spp. of Ampelita (& relatives) from Madagascar. tTaxa List which gives detailed descriptions of animal and shell and information on synonymy, distribution (with detailed map) habitat and biology and is for each species joined by a figure of a typical specimen in ventral and dorsal view. 11 pages focus the interest on the radulae of West African cones and a Selected Bibliography of nearly 100 titles id followed by an Alphabethical Index. The perfect colour-figures show roughly 1,300 shells, so covering all the high variability of the fauna. Five plates are devoted to illustrate live animals and habitats, the last four plates exhibit the very useful determination tool. A further part on the South-Ethiopian Province is in preparation by the same author-team. 2+35 S., 18 Fig., 27 col. Taf. variations are shown in detail, giving options for future studies. Four plates with magnified views of the apices and bodywhorl micro-sculptures enable easier determination, as do additional side-views of each species, making this a great tool for identification. 4+135 S., 143 Fig., 83 col. Taf. A great book with numerous pages of descriptions and identifications and a lot of superior full colour plates suitable for ID work - a must-have for researchers, abalone-farmers and conchologists interested in the Haliotis family. Showing 65 living species and subspecies of the genus Haliotis actually known to live worldwide, the publication provides information on biology, distribution, anatomy, taxonomy and systematics. Additional information includes an extensive 22-page bibliography. Eight of the plates summarise the shown species as thumb-nail images for quick reference and comparison. 2+18 S., 8 Fig., 51 col. Taf. This publication on Harpidae discusses the genera Harpa with 20 species, subspecies and forms, Austroharpa with 5 species and Morum with 26 species, one of which is here described new to science. A sumptuous 51 full-colour plates beautifully illustrate the text. Of the plates, 4 show magnified apices of the Morum-species, enabling easier determination of the depicted species, and 3 of the plates summarise the shown species as thumb-nail images for quick reference and comparison. 2+60 S., 107 Fig., 130 col. Taf. This large part of the Iconography series on Strombidae describes all recent conchs, tibias and spider shells worldwide with the genera Tibia (14 species and forms), Terebellum (1 species with 3 forms), Lambis (14 species, subspecies and forms) and Strombus (95 species, subspecies and forms). The text is supported by 121 b/w drawings and 130 superb full colour plates for reference and identification. Three of the plates summarise the shown species as thumb-nail images for quick reference and comparison. This 68-page part of the Iconography series on the family of marine turban shells deals with the vast genus of Turbo, including all the recent 66 species and 5 subspecies in 16 subgenera. Each species is described in great detail, supported by drawings, as well as beautifully illustrated on the included superb full colour plates. Three of the plates summarise the shown species as thumb-nail images for quick reference and comparison. Currently in preparation: The Family Turbinidae, Subfamily Turbininae, Genera Astraea, Astralium, Guildfordia Cookia and Bolma, by Kreipl & Alf. 2+50 S., 54 Fig., 33 Ktn., 93 col. Taf. This monograph introduces the variable and colourful enzootic Australian Volute genus of Amoria. Illustrating and describing in detail all 29 species and subspecies, as well as many named forms, several of the taxa are new to science and introduced here for the first time. Included are plenty full colour plates, showing images of living animals in their natural habitat and every variation and collectable form, thereby offering a clear determination tool in distinguishing similar taxa. Also included is information on types and type localities, distribution, biology, habitat and size range, making this a most exciting first part of the series for Volute collectors. One of the plates summarise the shown species as thumb-nail images for quick reference and comparison. 2+30 S., 6 Fig., 5 col. Taf. A taxonomic introduction to the recently described Volutidae by the world's best known amateur researchers on the Volutidae family. On 30 pages and 5 amazing full colour plates suitable for identification work on generic level, the authors present a current overview of systematics and taxonomy of the family Volutidae, including all recent species, subspecies, forms and variations. Included are descriptions and definitions of several new subgenera and tribes. 93 S. Text m. 22 Text-Fig. & 128 unnum. Ill., 2 Tab., 68 col. Taf. This monographic treatment embraces the descriptions and illustrations of all known Recent Volutes of thet Tribe, which forms together with the Caribbean Volutini the subfamily Volutinae of that vast family of much sought after marine shells. There are treated 64 species and subspecies (5 new to science and several further undescribed species never represented before) in detail. In the second issue of Visaya: E. L. Heiman, Felix Lorenz, Manuel J. Tenorio & Carlos M. L. Afonso, Gabriella Raybaudi Massilia, Eva Pip and Guido T. Poppe contributed with 6 articles containing descriptions of several new species. Other articles are: "Conchological Treasures from the Philippines" and "Intraspecific Variation in mauritia arabica". 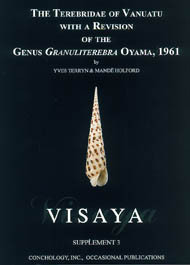 Visaya is now a co-production of Conchology, Inc. & Conchbooks. The journal is produced in the Philippines and printed and distributed from Germany out. This 220+ pages full color book is titled: The Seguenziidae, Chilodontidae, Trochidae, Calliostomatidae and Solariellidae of the Philippine Islands. It covers over 180 species, all figured. In the fifth issue of Visaya: Marco Chiapponi, Francisco Déniz, Winfried Engl, Koen Fraussen, José María Hernández, Felix Lorenz, Dan Massiglia, Somwag Patamakanthin, Guido T. Poppe, Colin Redfern, Emilio Rolán, Richard Salisbury, Dirk Stratmann, Frank Swinnen, Sheila Tagaro, Yves Terryn, Rene Vanwalleghem, Yves Verhaeghe, Chris Vos, John Wolff, and Gabriela Raybaudi Massilia contributed with 16 artices. Visaya is printed in color from cover to cover, 148 pp. 16 original works by 20 authors on Bayerotrochus (1 n. sp. ), Angaria (1 n. sp. ), Guildfordia (1 n. sp. ), Hipponyx (1 n. sp. ), Trivirostra (1 n. sp. ), Coriocella (1st descr. of shell), Cirsotrema (1 n. sp. ), Ancilla (1 n. sp. ),Hemipolygona (1 n. sp. ), Fusinus (1 n. sp. ), Nassarius (4 n. sp. ), Calliotectum (1 n. ssp. ), miters (18 n. sp. ).